Integrating Expressive Arts in Play Therapy: Participants will practice multiple techniques used in the expressive art therapy spectrum that can be integrated into play therapy with children and adolescents. The participants will be engaged in creative activities and supervised experience throughout the morning, including art interventions and creating group fairytales. Mandalas in Play Therapy with Traumatized Children: Recent studies indicate coloring mandalas, paired with relaxation, improves therapeutic outcomes with children affected by anxiety. This workshop provides an overview of mandalas, including their history, color analysis, interpretation, and the incorporation of ‘sacred circles’ into the play therapy process with children affected by trauma. Identify two recent research findings that indicate the benefits of coloring mandalas with traumatized children in play therapy. Articulate the five steps to incorporate mandalas into children’s play psychotherapy. Eric Green, PhD, LPC-S, RPT-S, SP, is a faculty associate at Johns Hopkins University’s School of Education in Baltimore, MD. He is the author and co-editor of “The Handbook of Jungian Play Therapy,” “Counseling Families,” “No Child Forgotten,” and “Integrating Expressive Arts and Play Therapy with Children and Adolescents.” Dr. Green is a regularly invited keynote speaker across the U.S. and internationally, including recent events in Hawaii, Mexico, Australia, Michigan, and North Carolina. He’s featured in four current Alexander Street Press films, including “Expressive Arts with Adolescents.” Eric maintains a private-practice in child psychotherapy in south Louisiana. Women’s and Children’s Center parking deck. LUNCH WILL BE PROVIDED from 12:00-1:00. Registrants canceling up to 48 hours before a workshop will receive a tuition refund less a $20 administrative fee, or if requested, a voucher good for one year for a future workshop. All requests must be made in writing or by email. No refunds issued for any reason after Jan 18, 2017. In the unlikely event the workshop cannot be held, registrants will receive complimentary admission to a rescheduled workshop or a full value voucher, good for one year, for a future workshop. ** ONLINE REGISTRATION DEADLINE IS MONDAY, January 15, 2018. NOTE: Rates go up $20 after Friday, January 8th, 2018. Group Discount $10.00 per registrant for groups of 3 or more registering together. Please specify if registering as a group and identify group members and affiliation. Check or money order only if registering by mail. No Purchase orders accepted. Credit Cards accepted if registering online or onsite. Mail-in registration must be postmarked by January 8, 2018. Visit our website at www.alabamaplaytherapy.org and sign up to receive emails from AAPT so you can stay up-to-date with all news and announcements from AAPT! Facing ethical challenges can be, well, challenging! Ethics are ever-changing and evolving, as are the situations with which we might be faced as clinicians. During this training, we will utilize lecture, discussion, and a variety of vignettes to explore ethical challenges which may be faced by child clinicians, offering participants the opportunity to explore how best to respond to the challenges in the presented scenarios. Additional focus will be placed on issues such as informed consent and assent, custody arrangements, and confidentiality. As well, there will be an exploration of the APT Play Therapy Best Practices and the Paper on Touch – suggested guidelines to working with children in therapy. Additionally, we will explore contemporary challenges which many child clinicians are faced, such as the incorporation of social media and the intersection of ethics and the legal system. Explain an ethical scenario which may commonly create ethical challenges for child clinicians. Express knowledge of the Association for Play Therapy paper on Play Therapy Best Practices. Recognize what constitutes an ethical dilemma. Discuss steps in an ethical decision making model. List two ethical issues relevant to implementation of technology in child and play therapy practice. Dr. Mistie Barnes, Assistant Professor of Counselor Education at Delta State University, is a Licensed Professional Counselor-Supervisor and Registered Play Therapist-Supervisor. She is also the founder and director of the Delta State University Play Therapy Training Institute. Dr. Barnes maintains a limited private practice, provides clinical supervision in counseling and play therapy, speaks internationally on play therapy and related topics, and has published chapters and techniques in several books. Dr. Barnes is the current Clinical Editor of the Play TherapyTM Magazine for the Association for Play Therapy and is President of the Mississippi Association for Play Therapy. In 2014, Dr. Barnes was honored to receive the Professional Education and Training Key Award from the Association for Play Therapy. LUNCH: BOX LUNCH WILL BE PROVIDED. Registrants canceling up to 48 hours before a workshop will receive a tuition refund less a $20 administrative fee, or if requested, a voucher good for one year for a future workshop. All requests must be made in writing or by email. No refunds issued for any reason after April 28, 2017. In the unlikely event the workshop cannot be held, registrants will receive complimentary admission to a rescheduled workshop or a full value voucher, good for one year, for a future workshop. Social Workers: AAPT is approved by the Alabama State Board of Social Work Examiners (ABSWE) to offer continuing education to social workers. ASBSWE Provider No. 0284. REGISTER EARLY – SEATING IS LIMITED! Spaces are not guaranteed until your registration is processed. Mail in registration must be RECEIVED by Friday, April 21, 2017. Online Registration deadline is Friday, April 21, 2017. NOTE: Rates go up $10 after April 21st. ** ONLINE REGISTRATION DEADLINE FRIDAY, April 21, 2017 before midnight. Group Discount of $10.00 off per registrant for groups of 3 or more registering together. Go to the conference area of the website at www.alabamaplaytherapy.org and sign up to receive emails from AAPT so you can stay up-to-date with all news and announcements from AAPT! AAPT is sponsoring a Workshop by Liana Lowenstein, MSW, RSW, CPT-S. The workshop will address Playful CBT Interventions for Children with Anxiety. Liana Lowenstein is a Registered Clinical Social Worker, Certified Play Therapist-Supervisor, and Certified TF-CBT Therapist who has been working with children and their families since 1988. Cognitive-Behavioral Therapy (CBT) is the most empirically supported treatment for treating childhood anxiety. In this one-day workshop, a brief overview of CBT will be presented, along with innovative play therapy techniques to engage, assess, and treat children with anxiety. Interventions will address the core treatment components: Psychoeducation, somatic management, affective expression, cognitive restructuring, exposure, and relapse prevention. many of the interventions can be adapted for use with other treatment populations. Visit Dr. Lowenstein’s website for more information about her work. Early Bird Registration is via Online or Postal Mail registration by Deadlines (below). For registration by Postal Mail: download, fill out, and send registration form and payment to the address provided on form. June 9th, 2017 ~ Early Bird Rates deadline for Online and Postal Mail registration (must be postmarked by this date). NOTE: Early Bird Rates are not available after Friday, June 9th, 2017. June 12th, 2017 (end of day Monday, midnight) ~ Online Registration will be closed. June 16th, 2017 ~ Friday On-site Registration, participants can register on-site the morning of the workshop. REGISTER EARLY – SEATING IS LIMITED! Spaces are not guaranteed until your registration is processed. Mail in registration must be postmarked by June 9th, 2017. Online Registration deadline is Monday, June 12, 2017. NOTE: Rates go up $20 after Friday, June 9th, 2017. If you are interested in membership, please send a separate check made out to APT for dual membership in APT (Association for Play Therapy Association) and AAPT (Alabama Association for Play Therapy) along with your completed membership application. Membership applications are available online or from membership chairman Stephanie Bales, stephhbales@gmail.com. ONLINE REGISTRATION DEADLINE IS MONDAY, June 12th, 2017. Workshop participants can park in the North Tower Parking Deck; additional parking is available in the Women’s and Children’s Center parking deck. Parking is $6 for the day. Registrants canceling up to 48 hours before a workshop will receive a tuition refund less a $20 administrative fee, or if requested, a voucher good for one year for a future workshop. All requests must be made in writing or by email. No refunds issued for any reason after June 12th, 2017. In the unlikely event the workshop cannot be held, registrants will receive complimentary admission to a rescheduled workshop or a full value voucher, good for one year, for a future workshop. 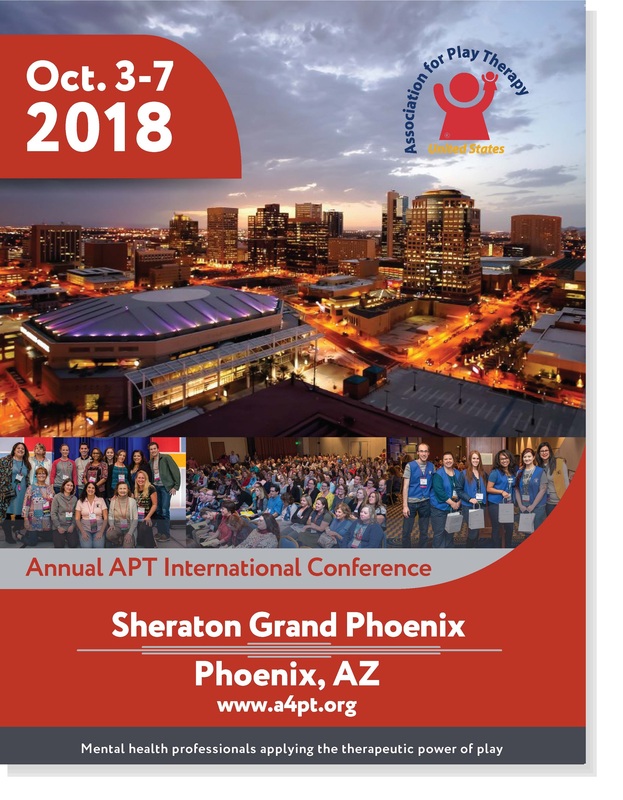 Stay up-to-date on all that is happening with AAPT!! !